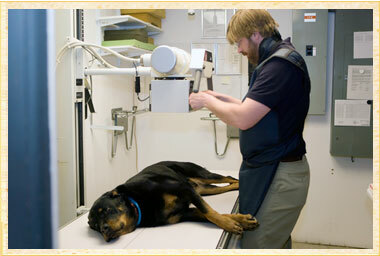 Radiology is an essential diagnostic tool in veterinary medicine. Radiographs (x-rays) are used for assessing pets with a wide variety of ailments. X-rays are used to diagnose many conditions including broken bones, tumors, bladder stones and determining the location of a foreign body in your pet's stomach (a bone, toy, article of clothing). They are useful for diagnosing heart and lung problems and are also used to evaluate hip and elbow dysplasia. Special procedures (such as barium series) help evaluate your pet's gastrointestinal tract for motility problems and obstructions. In order to provide the most accurate radiographic diagnosis possible, Rhinebeck Animal Hospital has invested in the latest x-ray technology. Our radiographs have repeatedly been praised by specialists for their diagnostic quality. 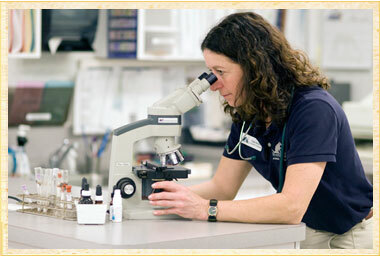 Rhinebeck Animal Hospital uses the latest laboratory equipment for diagnosing your pet. Our in-house laboratory is capable of quickly and accurately processing results for your pet, resulting in faster diagnoses - and faster treatment for your pet. Our laboratory is staffed by trained veterinary technicians who are skilled in interpreting your pet's results quickly and accurately. During an emergency, your pet needs to be diagnosed and treated as quickly as possible. With our state-of-the-art laboratory analyzer, we are able to perform blood chemistry profiles and serum electrolyte measurements within a matter of minutes. With fast and accurate laboratory results in hand, our veterinarians and technicians can begin your pet's treatment almost immediately. Dogs, and sometimes cats, can develop glaucoma, a serious condition in which the pressure in the eyeball is elevated. Glaucoma needs to be diagnosed and treated very quickly because increased intra-ocular pressure can lead to blindness. We use a hand-held electronic instrument, called a tonopen, which accurately determines the pressure in the eye. This is a painless procedure that can be performed in the exam room. Our doctors routinely perform and interpret electrocardiograms (ECG's) on site. Electrocardiography enables us to diagnose and treat heart disease and to detect arrhythmias that could be life-threatening.